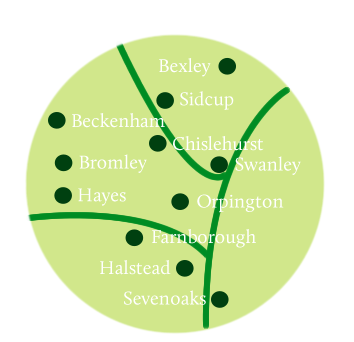 Based in Orpington, we work throughout Kent and the outskirts of London, including Biggin Hill, providing homeowners from across the region with the very best bathroom design services, new shower installations, bathroom installations and new central heating systems. Below, you can see a few comments from just some of our satisfied Biggin Hill customers. “I wanted to thank you all so much, not just for the superb job you did on my net bathroom, it looks amazing, but also for the excellent customer service throughout, from that initial meeting, going through all the design possibilities and then even the fitters themselves were all so friendly and professional I was just really impressed with everything you did. “Thanks again for all the hard work that went into our bathroom, we really didn’t think you were going to be able to get the tub all the way up the stairs and round the corners but you did it and not so much as a nick on any of the paintwork; most impressed! “Cheque enclosed for your recent invoice. Also wanted to thank you for the job done; superb quality of workmanship, superb quality of service and a very fair price for an impressive final result.